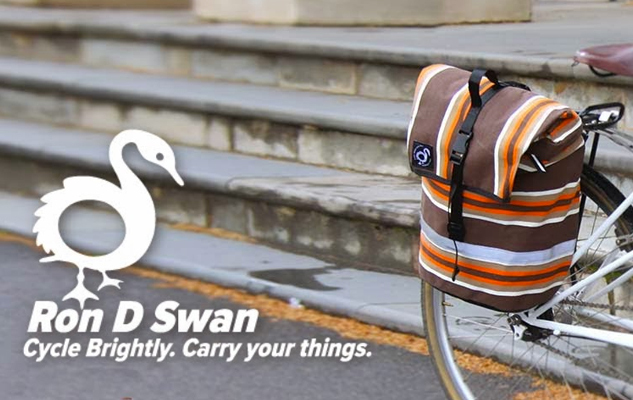 Ron D Swan has been our cycling centric range since 2005. Branded with our curious tyre swan, Ron, we’ve adorned many a city and commuter cyclist with colourful and distinctive Pannier bags, legbands, sashes, the back pack vest and musette. Since 2014, we have brought all products under the Industrial Sewing Workshop roof. We’ve kept most of Ron’s products and just slightly changed some things for manufacturing or performance reasons. P.S Right now, Ron D Swan is sitting in the garden just being a tyre swan and wondering what his next adventure will be.